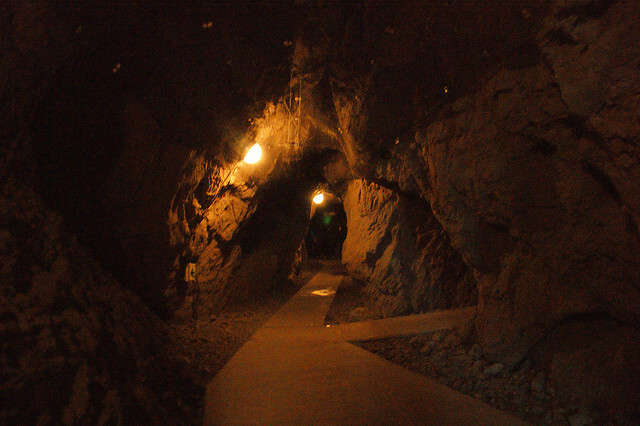 Much of the caves takes the form of long narrow tunnels. 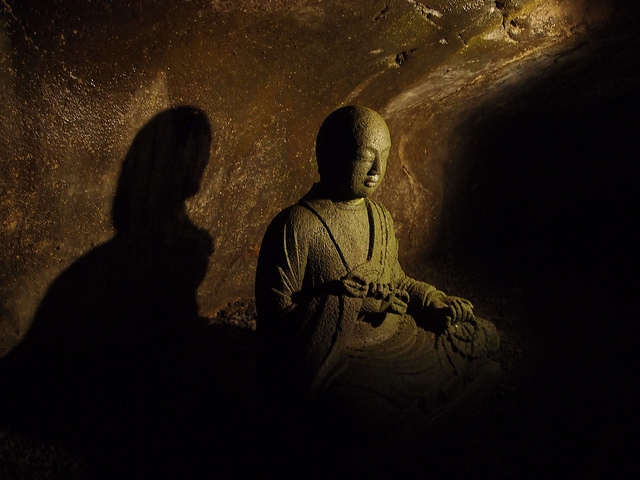 Almost 1500 years ago, an oracle advised the emperor to build a shrine in the Iwaya Caves, and in the years that followed, many renowned monks and influential samurai made pilgrimages there. Nowadays the caves are more of a tourist attraction than a holy site, but they still retain remnants of their mystic charm. 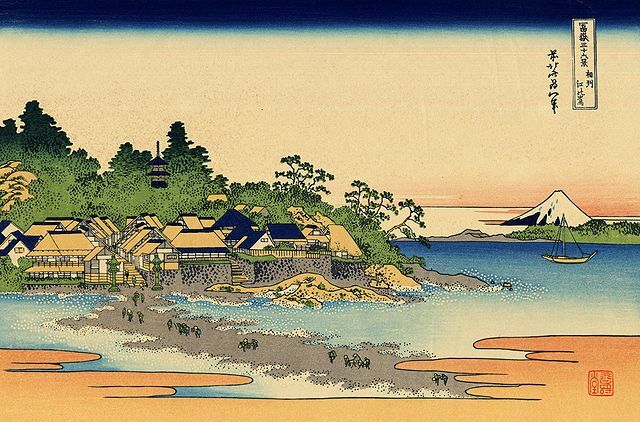 The caves are located on Enoshima Island, nowadays just 72 minutes from central Tokyo by train. The small rocky island is a popular tourist destination, home to a botanical garden, a lighthouse with an observation gallery, and a host of eateries and souvenir shops. It’s linked to the mainland by a 600 metre long causeway, and the beaches on the coastline nearby are packed with sun-lovers during the summer. The caves are at the back of the island, facing out to sea. To reach them, you need to climb a series of stairs to the top of the island, or for a small fee you can make the ascent by escalator instead. Then you descend 220 steps back down to sea level on the far side of the island. If all that sounds too energetic, there’s a ferry that will get you there from the mainland, but the timetable is a bit erratic – it depends very much on the time of year and the weather. The caves were eroded by the sea, but have since been elevated above the water level by repeated earthquakes. They’re accessed from the rocky seashore, near tidal pools peppered with crabs, fish and other marine life. They used to be reached by scrambling over rocks, but health and safety concerns mean that there’s now a solid concrete walkway complete with handrail. The first cave is the bigger of the two, and is entered by steps that lead down to a long narrow tunnel. You’re handed a candle lantern on the way in. You may wonder why, as most of the cave is well lit, but it does come in handy when you reach the darker corners. The entrance tunnel is lined with photos and information relating to the caves, and further back there are Buddhist statues. About two-thirds of the way in, the cave divides in two. The left branch extends 152 metres from the entrance, and contains statues of the island’s goddesses. The right branch is shorter, and contains a statue of the sun goddess Amaterasu, said to be a direct ancestor of the current emperor. Heading out of the first cave, you turn left and follow a walkway around the cliff face until you arrive at the imaginatively named ‘Cave 2’. This contains a statue of the dragon that used to terrorize the area, until the goddess Benten subdued him. Since then the dragon has been much better behaved, and has become the guardian deity of the local fishermen. If you clap your hands in front of his statue, you’ll be rewarded with flashing lights and the sound of thunder. 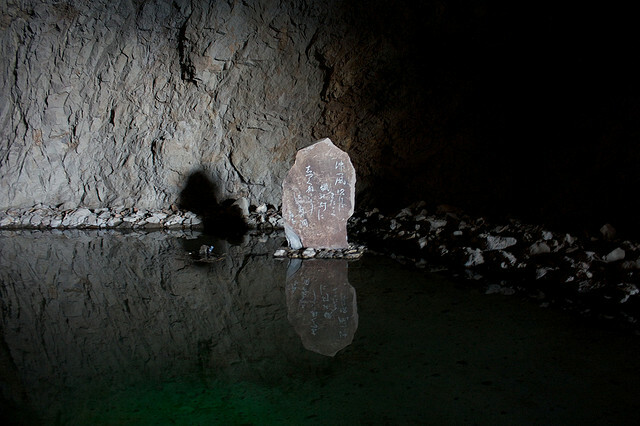 This inscribed stone in a pool of water can be found deep inside the cave. The popularity of the Iwaya Caves is probably as much to do with their pleasant setting by the sea, as with the caves themselves, but they do make an interesting add on to a day at the seaside. 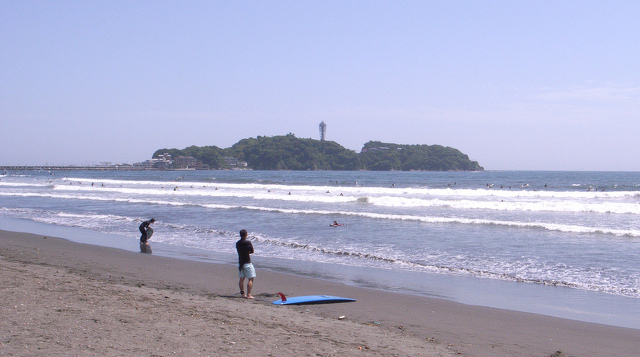 You can reach Enoshima on a direct Odakyu Line train from Shinjuku Station to Katase Enoshima Station (72 minutes, ¥610), or on the Enoden Line from Kamakura to Enoshima Station (24 minutes, ¥250). From either station, it’s about half an hour’s walk to the caves. Entry is ¥500, and they’re open every day from 9am to 4 or 5pm, except during extreme weather.